Much of our honeymoon was booked in business class on Asiana, including our outbound flight from Seattle to Seoul and our return flights from Hong Kong to Seattle, connecting in Seoul. Because (1) I lost a good number of pictures from the beginning of this trip due to a failed hard drive and (2) the flights were all fairly similar, I will just combine them into a single trip report here. Asiana only operates a two-cabin configuration on Airbus A330-300 aircraft out of Seattle. These “lie flat” seats may be flat but remain at a slight angle. As I have incredible difficulty sleeping on planes and Megan has incredible ease sleeping anywhere, we agreed it was a worthy trade-off for the convenience of not connecting somewhere else. Getting to Bali, even without the layover we added in Singapore, can still take 24 hours of traveling under ideal circumstances. 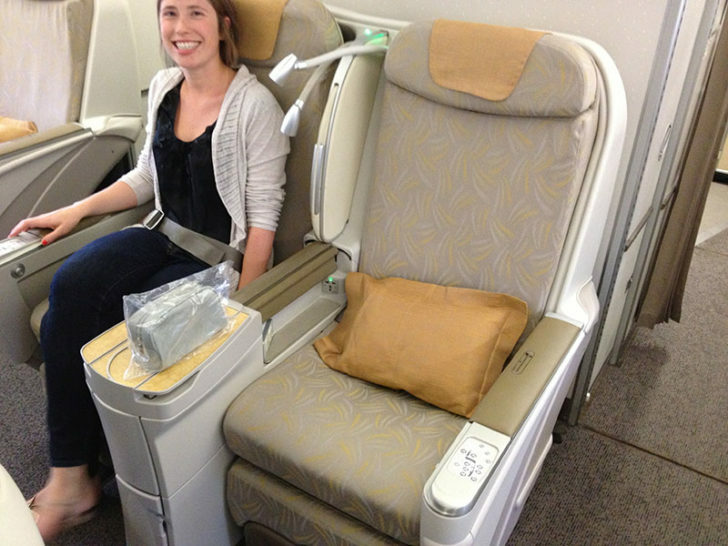 Allow me to point out a few other benefits to Asiana’s SEA-ICN route. It leaves in the early afternoon, which was great for us as we did most of the packing the morning of the trip. We could enjoy the British Airways lounge in Seattle’s S concourse, which has an excellent bar and arguably better surroundings than either the United or Singapore lounges at SFO. Award availability tends to be pretty good, too. Since the time of our honeymoon, Asiana has added a new non-stop from Seoul to Denpasar, meaning we can return to Bali with a single connection. These are enough merits for me to fly Asiana in the future. I am not the type who likes booking random flights simply to try a new route or a new aircraft type. My goal is the destination, and Megan has limited time off, so on important trips I do appreciate the ability to find direct and uncomplicated routings. Each seat is provided with an amenity kit, but no pajamas in business class. I found it amusing that only the small magazine rack was designated for storage during take off and landing; three cubbies were off limits. We couldn’t store anything under the seat in front, either. It was possibly the worst use of space on a plane I’ve ever seen, but the rules weren’t strongly enforced so long as everything was out of the way. What was even more annoying was the retractable center armrest, where the power outlets were located. It was a flimsy thing that would never stay put and automatically retracted whenever I put weight on it. Not much of an “armrest.” Fortunately international business class seats tend to have plenty of room. The amenity kit was sparing but included the basics, with L’Occitane toiletries. I didn’t find value in much of the items provided except the toothbrush. It is not hard to find a better face mask and earplugs to bring with you. The bag was of good quality, but there was not much in the way of separate compartments. I have others I prefer to use. Food was interesting. I stuck to traditional Western fare on all my Asiana flights since I don’t care for Korean food, but Megan is more adventurous. My steaks were well prepared, the sides were hot, and overall it was good (except the salmon mousse appetizer, which tasted about as good as it looks). I only have a picture of my return dinner, a beef tenderloin served with a side of pumpkin. What did Megan have? She doesn’t like me pestering her while she eats, so here’s the Korean dinner menu on our return flight. Not first class cuisine though better than most business class fare. Dessert and breakfast, however, were minor disappointments. I would have preferred a simple ice cream sundae over the somewhat odd flavored cakes and tarts we received, and the breakfast options — like this seafood crepe — were a bit exotic. Eggs and sausage are all I ever want. My experience with wine on planes is something like the “uncanny valley.” On a domestic flight, my expectations are lowered, and they usually get a cheap, over-flavored wine to make up for the loss of taste at high altitude in a dry environment. On international flights, I usually find very good options in first class. There is money to spend to find something that is both well made and tastes good in the air. In business class — even on a superlative carrier like Singapore — I’m often disappointed. I tried the Cotes de Francs, Pinot Noir, and Port with my meals, but otherwise opted for spirits or coffee after that. Avoid the cocktail list. Flight attendants aren’t bartenders, and my whisky sour was anything but. Otherwise the service on board was excellent. Our flight attendants were attentive and pro-active without hovering over usIf you need to get to Asia, don’t want to worry about availability, and can tolerate a few compromises in the quality of their hard product, Asiana is good option.